Why am I getting green edges on my burgundy Procion dye, in highwater immmersion dyeing? 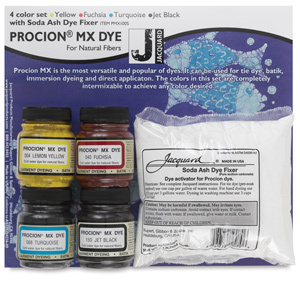 Large 8-ounce jars of Procion dye are more economical; don't forget to purchase soda ash and urea, as well! Soda Ash Dye Fixer 1 lb. Urea is a humectant. Humectants attracts moisture from the air, keeping the fiber damp longer allowing a greater reaction time for the dye. Urea is used with sodium alginate thickener when printing, painting or directly applying Procion dye to fiber or is added to Procion dye for super intense color. A derivative of seaweed, this is the best thickener for Procion MX Dye . A thickener is used to control spreading when painting or screen printing. Sodium alginate is used to thicken the dye to a paste consistency for printing and hand painting. Use Sodium Alginate SH for cotton and other cellulose fibers. It may also be used for silk when fine line definition is not required. Use Sodium Alginate F for silk and synthetics when fine line definition is desired. So, I dye my fabric using highwater immersion dyeing technique and I want to get nice burgundy color on my T-shirts, (JACQUARD-PROCION MX - BURGUNDY), but every time I can see green dye on the edges (a lot of green). I know burgundy is a mix of seven different dyes and it is hard to get nice even color. What can I do to get rid off this green places? First I paste up my dye (I use urea water), then mix it in a blender (always up to 3 teaspoons for 0,5 L) then I strain dye liquid through pantyhose and then I stir for many many times and it does not help (I add salt to dissolved solution in the end). Could you help me? How are you getting any edges in high water immersion technique? You should not see any differently-colored edges at all, if your high water ratio immersion dyeing technique is good. The dye should be reaching every part of the garment equally. It sounds as though you are not using enough water, or not stirring enough, or adding the soda ash too early in the process. Less likely is the possibility that you are not successfully pre-washing your shirts, so that some residue of the manufacturing process is acting as a resist and slowing dye access. Weigh your t-shirts while they are still dry. The amount you can dye at one time depends on the size of your dyebath container. For every pound (or about 500 grams) of dry fabric, you will need 3 gallons (12 liters) of water, in approximately a five-gallon (20 liter) bucket. The ratio of water to fabric, by weight, should be twenty or twenty-five times as much water as fabric. One pound of t-shirts is only two or three adult t-shirts, depending on size. If you want to dye a larger quantity, use a top-loading washing machine, which typically will hold up to five pounds of fabric, or up to eight if it is one of the larger capacity home washing machines. The agitation of the machine saves you the bother of stirring for over an hour. Some front-loading washing machines work well enough for dyeing, while others do not, depending on whether the washing machine has dispensers that allow you to add the dye and the soda ash at the right times. Front-loading washing machines in Europe appear to be more likely to have the correct dispensers than front-loading washing machines in the US. It also matters a great deal when you add your soda ash. In many dyeing techniques, when color separation is desired, the soda ash is added at the same time as the dye, or before the dye. For high water ratio immersion dyeing, you should add the soda to the fabric long after adding the dye. You want the dye to fully penetrate every bit of the fabric without soda ash, so that it is soaking through the fibers without reacting with them; only after the dye has fully penetrated every fiber do we then add the soda ash. Here is an overview of the correct technique. First wet your fabric thoroughly in the plain water (treated with the water softener sodium hexametaphosphate, if your water is hard), then remove the fabric from the dyebath. Now add the salt and make sure it is thoroughly dissolved in the dyebath, and then add the dye, which you have prepared using the excellent technique that you are already using. Do not add the salt directly to your dye concentrate, before adding it to the rest of the large quantity of water! Adding salt directly to your dye concentrate will cause dye to fall out of solution, so that it is no longer dissolved in the water and will no longer be available to dye the fabric. After the dye is fully mixed in, add the wet fabric back to the dyebath. Stir it for fifteen or twenty minutes to allow the dye to penetrate. After the dye has had this opportunity to completely soak into the fabric, only then you can add soda ash to the dyebath, avoiding pouring the soda ash directly onto the fabric. I prefer not to add the soda ash all at once, but instead no more than about one-third at a time, stirring for at least five minutes in between each addition. Finally, stir for about an hour to allow the dye to react with the fiber and the soda ash. Many high ratio immersion dyers mix a drop of hand dishwashing liquid detergent or other surfactant into the dyebath, before adding the dye, to encourage the dye to penetrate very smoothly. Surfactants function to break the surface tension of the water. Dharma Trading Company recommends a product called Calsolene Oil, using 7.5 ml per 12-liter dyebath, as a surfactant. Usually, however, with enough stirring, it is possible to get good results without a surfactant. If your water ratio is too low, or if you do not stir the fabric enough during the dyeing process, then, instead of a solid color, you will get variegated colors, as in the low water immersion (LWI) procedure. The colors can separate out in LWI just as they do in tie-dyeing. The problem is that, when you are tie-dyeing, with soda ash added at the beginning, the faster-reacting dyes strike the fabric immediately, while the slower-reacting dyes crawl farther. If soda ash is not added until the end, then the reactivity of the dye is not a problem, but the relative sizes of the dye molecules is, with the smaller dyes traveling farther than the larger dye molecules. It's just like the school chromatography experiment in which you dot marker ink on a piece of paper and place the bottom edge of the paper into water; as the water creeps up the paper, the different colored pigments in the marker ink separate out. The fact that your edges are green suggests that you are adding the soda ash early in the process, because of the fact that fuchsia is a faster striking dye; when soda ash is added late in the process, turquoise is among the slowest of the dye molecules to move, since then size is the only issue, so then halos will not be green. The burgundy mix you are using happens to contain fuchsia (Procion Red MX-8B), which is the fastest-striking of the Procion dyes, combined with a blue dye and a yellow dye that react more slowly, so, in direct dye application methods like tie-dye and dye painting, you end up with greenish halos, as the blue and yellow separate out from the red. This same dye mix normally works perfectly in high-water-ratio immersion dyeing, when then there are no edges where the dye can separate out. In low water immersion dyeing, dye painting, or tie-dyeing, there are two different approaches to solving this problem. One is to mix the color yourself, using Procion Red MX-5B instead of Red MX-8B. Red MX-5B is called "034 Magenta" by Jacquard Products, "Light Red" by Dharma Trading Company, and "Mixing Red" by PRO Chemical & Dye. [Edited to correct a typo in the code for the dye.] This red dye is very similar in color to Fuchsia (Red MX-8B), but it does not react as quickly. Since its properties are more similar to those of the other colors of Procion MX dyes, it blends in better in mixtures for tie-dyeing and printing. You would start by mixing red MX-5B and a little navy blue to produce a sufficiently dark reddish purple, then add yellow or orange to dull down the color toward burgundy. Alternatively, a very popular approach, though only for dye painting or for tie dyeing, is to thicken your dye. This method is not suitable for immersion dyeing. Many tie-dyers always add thickener to their dye mixtures, as it enables crisper color contrasts on the fabric. To do this, you would mix up some sodium alginate with water, following instructions to reduce clumping; after it is smooth, you would mix up your dye mixture as usual, but then add some of the dissolved alginate, to make your dye thicker. The thickener will keep the dye from creeping along the fabric as far, reducing the amount of color separation. This is not a solution for the high water immersion dyeing situation, however, in which the true answer to the problem requires producing a single solid color. I hope that this discussion will help you to track down the source of the problem that is causing your green edges.